From the earliest times mistletoe has been one of the most magical, mysterious, and sacred plants of European folklore. It was considered to bestow life and fertility; a protection against poison; and an aphrodisiac. 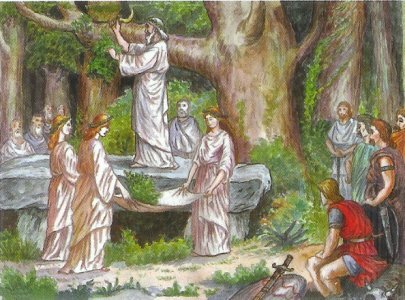 The mistletoe of the sacred oak was especially sacred to the ancient Celtic Druids. On the sixth night of the moon white-robed Druid priests would cut the oak mistletoe with a golden sickle. Two white bulls would be sacrificed amid prayers that the recipients of the mistletoe would prosper. Later, the ritual of cutting the mistletoe from the oak came to symbolize the emasculation of the old King by his successor. Mistletoe was long regarded as both a sexual symbol and the “soul” of the oak. It was gathered at both mid-summer and winter solstices, and the custom of using mistletoe to decorate houses at Christmas is a survival of the Druid and other pre-Christian traditions. The Greeks also thought that it had mystical powers and down through the centuries it became associated with many folklore customs. In the Middle Ages and later, branches of mistletoe were hung from ceilings to ward off evil spirits. In Europe they were placed over house and stable doors to prevent the entrance of witches. It was also believed that the oak mistletoe could extinguish fire. This was associated with an earlier belief that the mistletoe itself could come to the tree during a flash of lightning. The traditions which began with the European mistletoe were transferred to the similar American plant with the process of immigration and settlement. Kissing under the mistletoe is first found associated with the Greek festival of Saturnalia and later with primitive marriage rites. They probably originated from two beliefs. One belief was that it has power to bestow fertility. It was also believed that the dung from which the mistletoe would also possess “life-giving” power. In Scandinavia, mistletoe was considered a plant of peace, under which enemies could declare a truce or warring spouses kiss and make-up. Later, the eighteenth-century English credited with a certain magical appeal called a kissing ball. At Christmas time a young lady standing under a ball of mistletoe, brightly trimmed with evergreens, ribbons, and ornaments, cannot refuse to be kissed. Such a kiss could mean deep romance or lasting friendship and goodwill. If the girl remained unkissed, she cannot expect not to marry the following year. In some parts of England the Christmas mistletoe is burned on the twelfth night lest all the boys and girls who have kissed under it never marry. Whether we believe it or not, it always makes for fun and frolic at Christmas celebrations. Even if the pagan significance has been long forgotten, the custom of exchanging a kiss under the mistletoe can still be found in many European countries as well as in Canada. Thus if a couple in love exchanges a kiss under the mistletoe, it is interpreted as a promise to marry, as well as a prediction of happiness and long life. In France, the custom linked to mistletoe was reserved for New Year’s Day: “Au gui l’An neuf” (Mistletoe for the New Year). Today, kisses can be exchanged under the mistletoe any time during the holiday season. Mucus – is it our friend or foe?